Keep your countertops, shelves and vanities spotless and free from sticky, drippy, gooey messes with the set of 3 various size Sink Mats. Highly absorbent microfibre and foam mats. 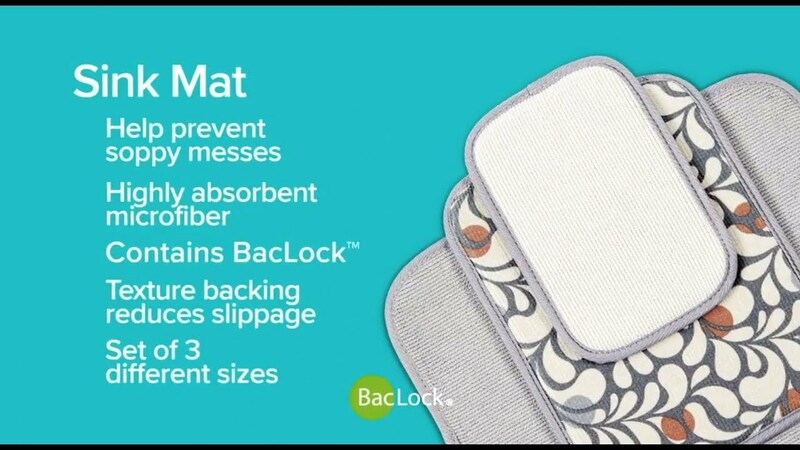 Features microfibre top and foam layer with textured bottom layer with silicone dots to reduce slippage. Where to Use: Place near any sink or tap to provide a resting place for wet or messy bottles, glasses, cups, toothbrushes, bathtub toys, pet products and soap dispensers. Maintenance: Slightly dirty mats can be washed with Norwex Dishwashing Liquid under warm running water and used again before laundering. Rinse thoroughly after washing and always hang to dry. Heavily used mats should be laundered using a Norwex Ultra Power Plus, which contains no ﬁllers. You can buy the Norwex Sink Mats online from me, in Australia. Or you can buy them in New Zealand here. If you are elsewhere, check Norwex.com to find a consultant in your country.